Connectify Hotspot turns your PC into a virtual router and allows you to share your Internet connections with all devices. So, why not share a secure Internet connection while you're at it? Internal Ethernet card, External Ethernet USB adapter (optional). Step 1: Purchase Connectify Hotspot PRO or MAX from the Connectify website. While there is a free trial version of Connectify Hotspot, sharing 3G/4G or Ethernet connections as WiFi is only available in the PRO and MAX versions. Step 2: Start and connect your VPN. 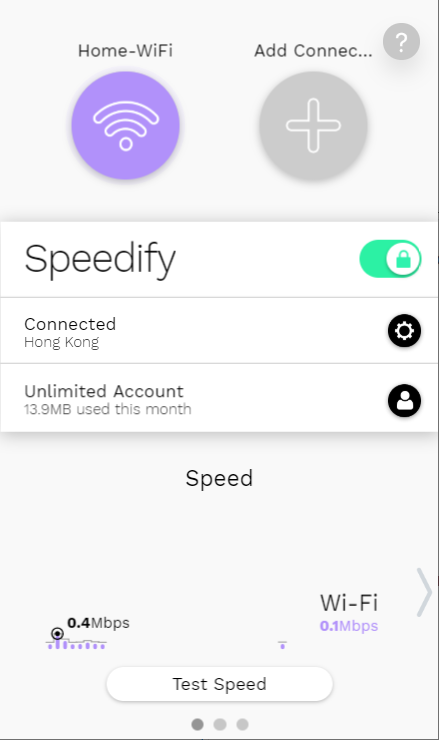 If you're not sure which VPN to choose, we recommend going with a mobile VPN such as Speedify, that can also combine multiple connections at the same time. Step 3. Open Connectify Hotspot and choose Wi-Fi Hotspot. Step 4: Make sure your VPN is selected from the ‘Internet to Share’ dropdown. Icons next to each adapter tell you what kind of Internet connection you’re selecting. Step 5: Choose between Routed or Bridged. Learn more about the difference between Routed and Bridged mode by clicking this LINK. Step 6: Give your hotspot a name (SSID) and password. The hotspot name is the network name that other devices will see and connect to using your unique password. Your Connectify Hotspot is a real, working hotspot that you use just like any other wireless network. Optional: Choose the 'Ad Blocker' option as this feature will save you a lot of data. Learn more about the universal ad blocker in Connectify Hotspot. Step 7: Click the ‘Start Hotspot’ button to begin sharing your Internet connection with your other devices.